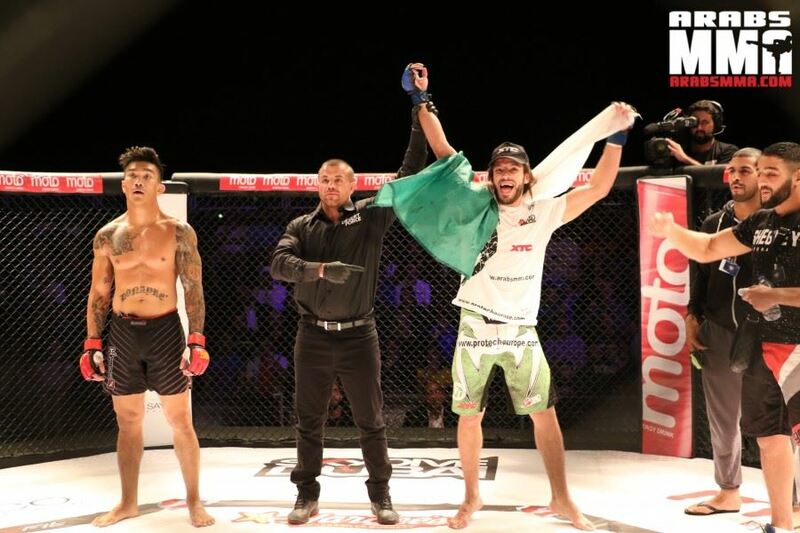 Algerian fighter Walid Seghir made a successful promotional debut at Desert Force 20 as he managed to sink in a tight rear-naked-choke against Filipino opponent Vaughn Donayre 3 minutes into the first round. Watch Walid Seghir (video below) call out Desert Force featherweight champion Aziz Julaidan who hasn’t defended his title yet for over a year. Julaidan Aziz (3-1) earned the shield back in December 2014 when he knocked out Abdulkareem Al Selwady to become the first ever Saudi Arabian to earn a title in Desert Force. Since then, the champ has been getting quite a number of challengers, including Al Selwady who is asking for a rematch, Ezzedine Al Derbane who wants to bring back the shield to Jordan, and now Algerian Walid Seghir who is announcing dropping to 66kg. I feel great about my last fight in Dubai. It was a great victory in the first round by submission, again. I am dropping down to 66kg and I want to fight Aziz Julaidan because I want the shield. Julaidan has the shield and he hasn’t defended it for over one year. Now I am calling you Aziz Julaidan for the next Desert Force event in March. I will submit you in the first round. If you want to prove to everybody that you deserve this title, come fight me. Be Brave. Take This Fight. True Ja3bari.. You are right.. Give him 2 or 3 more fights. Lets see how good he really is! I think rami aziz, elias boudegzdame, chabanne chaibedra and seghir walid beat easly selwady or julaidan ! I totally agree with ja3bary .. walid even didnt play in 66 kg divisiob for God sake ! Will his first match in 66 kg be againsg the champ !! Noòo way! True but i still think he is the best 66 in ME ! May be you are right. But Selwadi is the former champion not the current champion. Selwadi did not perform well against Cadet. The 66 kg weight division needs more confrontations inside the cage to reveal the real champion.